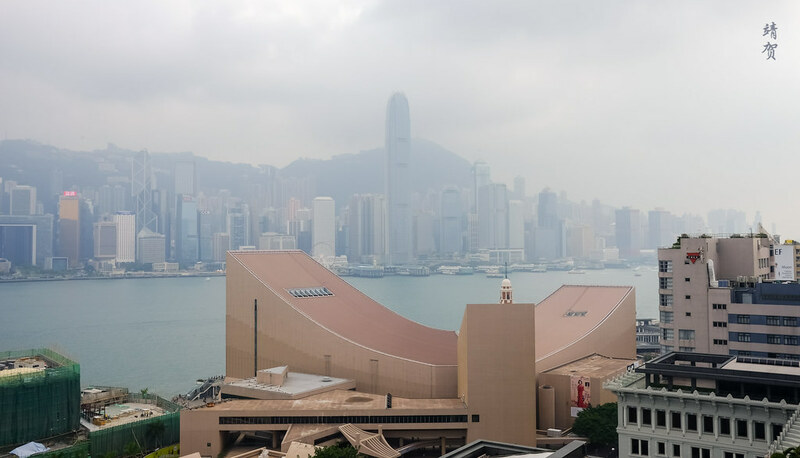 In Hong Kong, I have stayed previously in the Sheraton where I reviewed the Towers property. 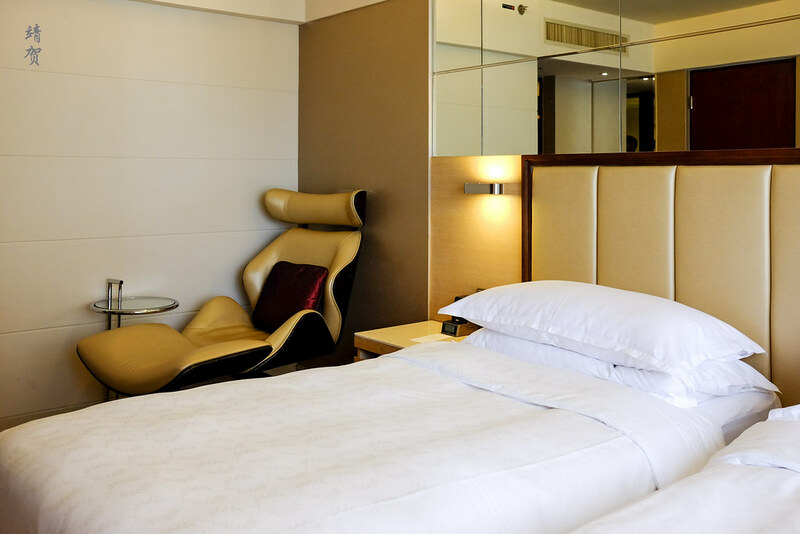 Considered as one hotel sharing the facilities, the Towers section is a separate premium segment where even SPG Platinum guests do not get upgraded towards. As I had done the Towers room previously, I booked the standard Sheraton Hotel to see the SPG Platinum guest treatment at this hotel. After we were dropped off in the porch on a taxi, the bell boy took our luggage as we proceed to the second floor via escalators to the reception desk. The lobby has low ceilings being an older property but it is pleasant as I queued in the SPG Gold & Platinum line. There was a longer line in the main queue for checking-in since it was past 2pm when we arrived. 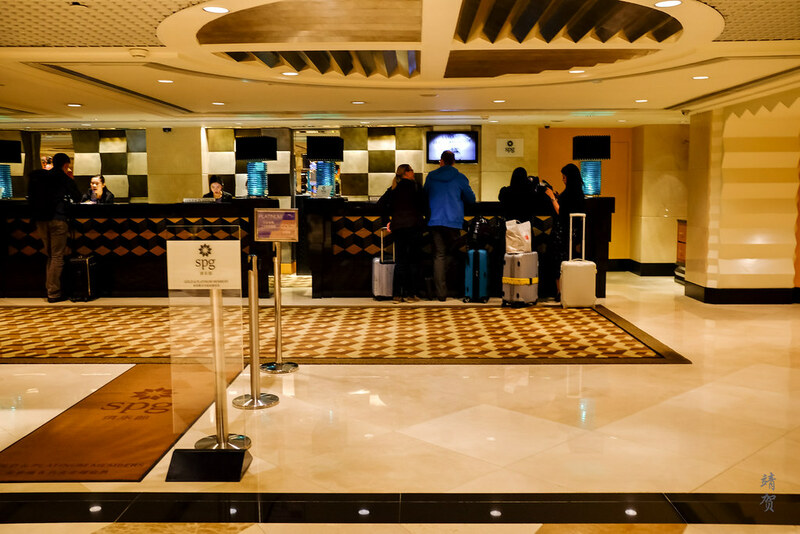 Check-in took a while as the hotel seems popular due to its convenient location and it was full over the weekend. As such the agent had some difficulty in finding an available room for me. There was also no upgrades available with a partial harbour view room being the best she could assign me to. However as I was staying 2 nights, I would be moved to a full Harbour View room the next day. 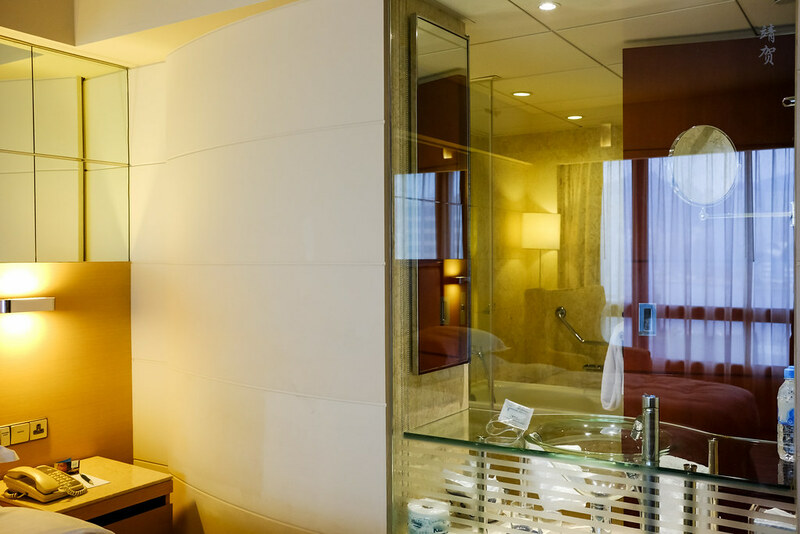 SPG Platinum guests do not get upgraded to the rooms in the Towers section which is located higher up and has its own lounge and better in-room amenities. For the first night, my assigned room was on the 9th floor and it is more of a standard sized room with a relatively small footprint. With the twin beds taking up nearly all of the space, there was only space remaining for a leather lounge chair and a circular side table. 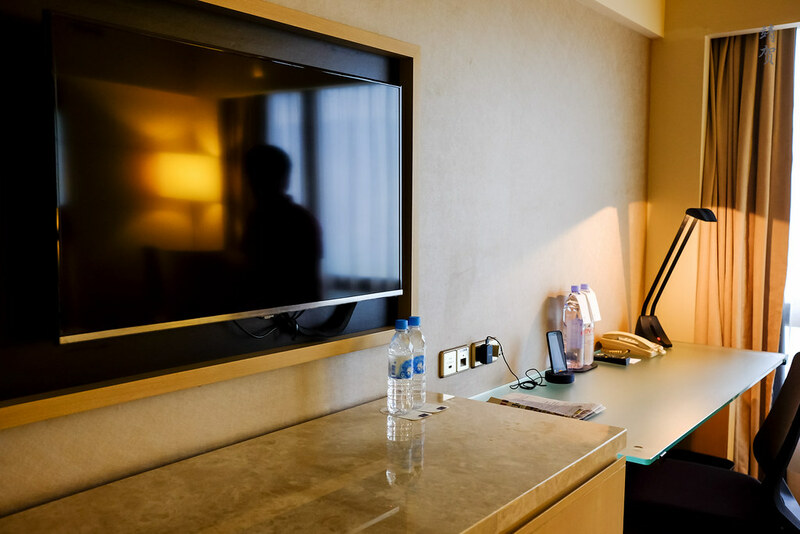 Across from the beds lies the a work desk and a wall mounted flatscreen TV with no console so that limits the storage space. A travel adaptor was attached tp the power outlets and the Sheraton in Hong Kong provides the Handy mobile phone with a local number and data for complimentary use. This means it is friendly for tourists as they need not purchase a local SIM card. The bathroom is small as well though the hotel did try to give the impression of space with a transparent all-glass vanity countertop and sink. While unique, I prefer the traditional countertop setup. 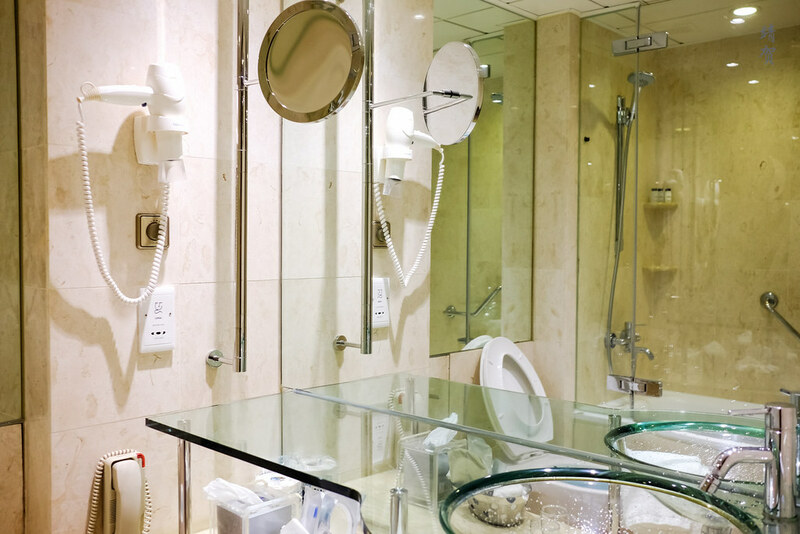 As a small bathroom, the shower is over the bathtub, with the tub not really usable for a soak. 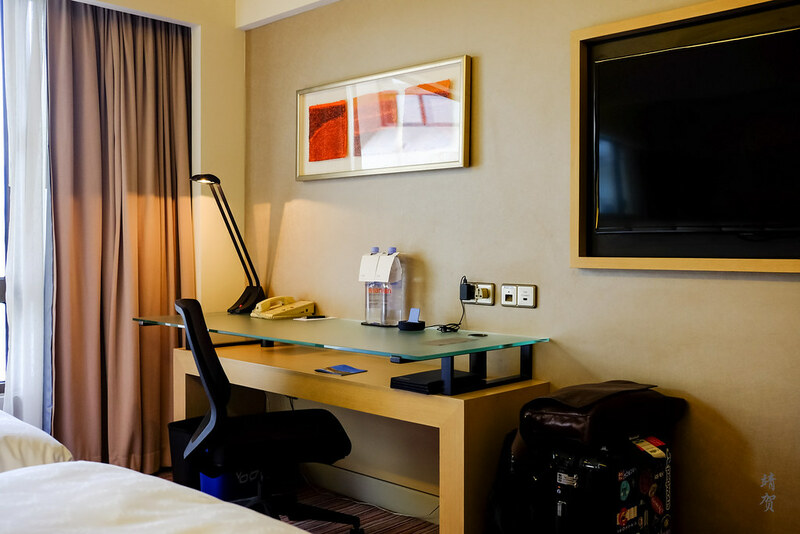 This was also my first stay in a Sheraton that has the refreshed amenities. 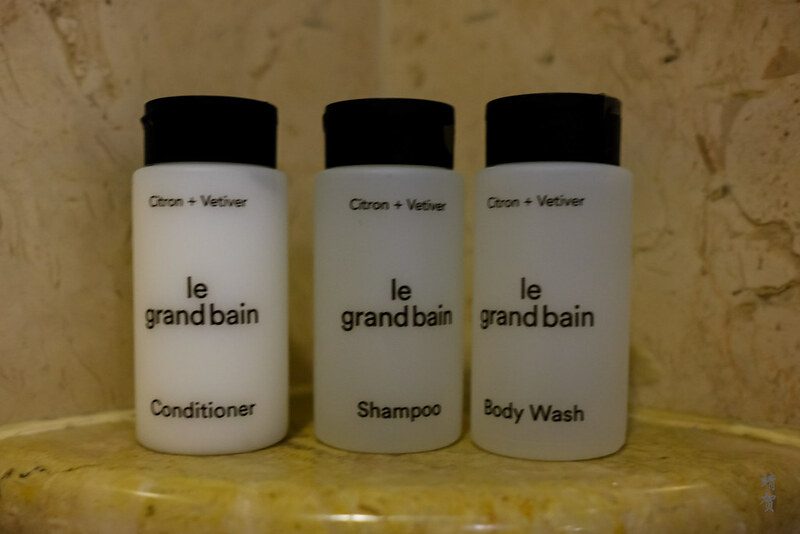 Sheraton used to supply a Mandarin and Mint scented bath amenity though they changed it to a more neutral scent with the re-branding. Standard and neutral just seems typical for a Sheraton which is perhaps the most common brand within the SPG portfolio. 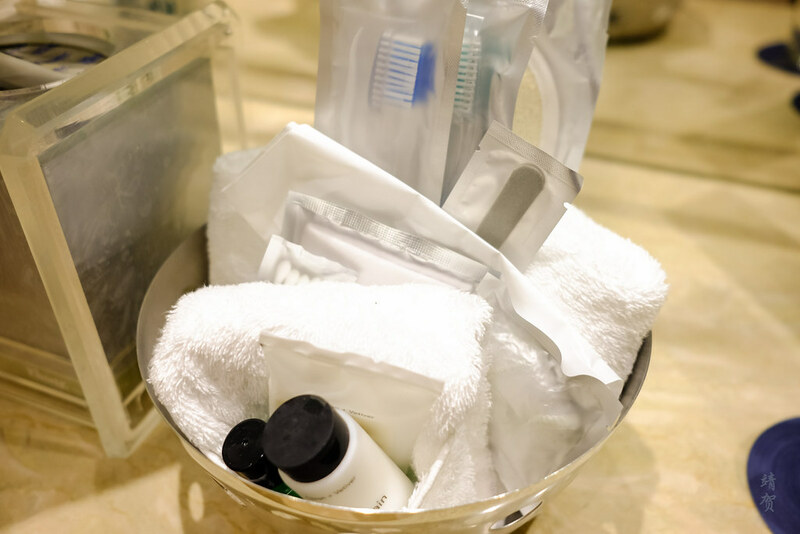 Being a hotel in Asia, there was plenty of other amenities such as cotton buds, dental kits and loofah pads in a basket. 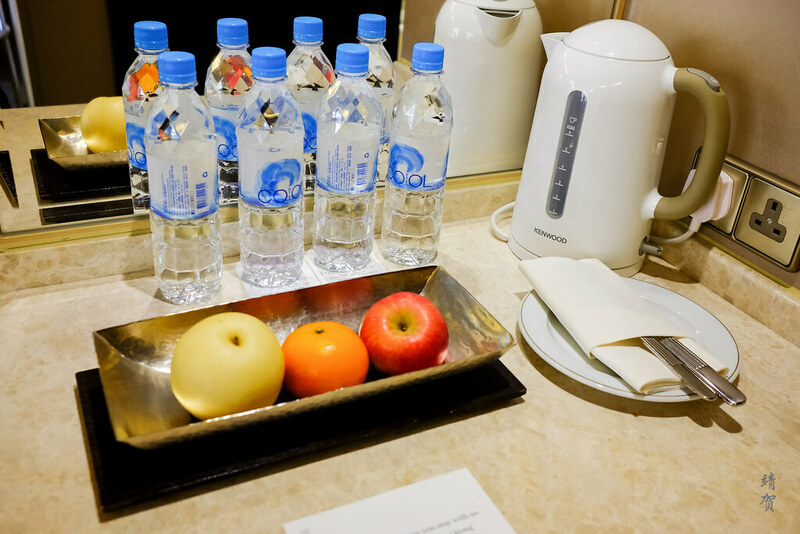 In addition to the standard room amenities, I found a tray of fruits as a welcome amenity above the minibar and was glad they supplied more than the standard 2 bottles of water in the room. It was easy to request for more bottled water in the room later at night as well. 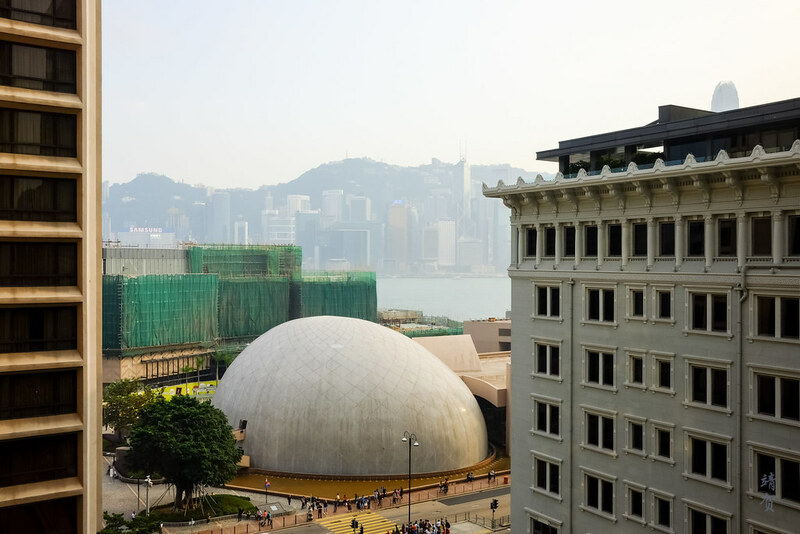 This room has a partial harbour view since it faces Nathan Road with the view blocked by the from of the hotel and the Peninsula beside it. As far as the view is concerned, I found this to be pretty good and if you are not planning to spend much time looking out of the window, it is more than acceptable. On the second night, we moved to a Deluxe Harbour View room and this one similarly has twin beds. It was obvious from the start this was a larger room with the armchair placed beside the window for more natural light when reading. While the armchair might not look as pretty as the one in the last room, it was comfortable to lounge in as it has its own leg rest. 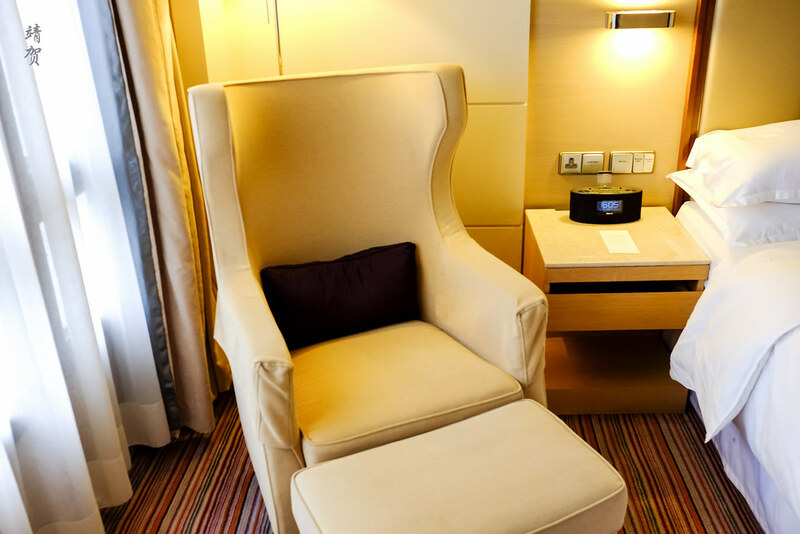 There is no side table though so guests have to use the bedside table when lounging here. In addition, there was a console beneath the flatscreen TV located beside the work desk. This provides more space to store your belongings. Another feature that makes this room feel larger was the glass partition between the room and bathroom which opens up the space. 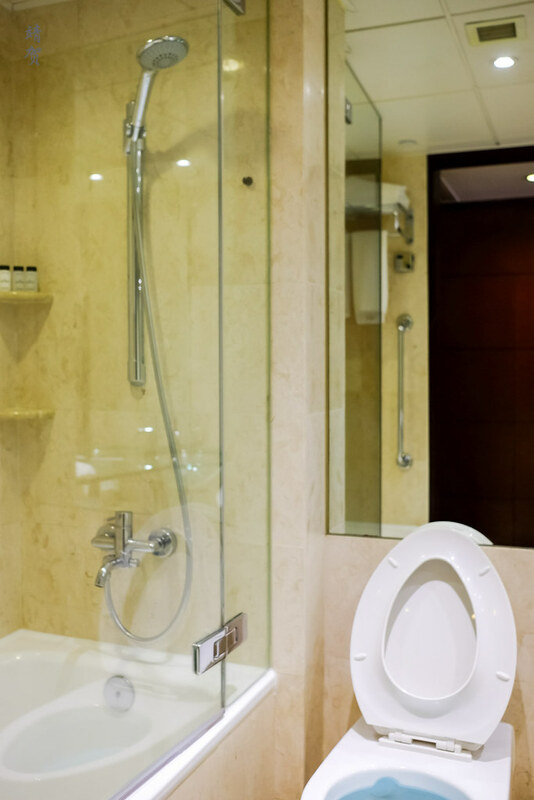 There are curtains that can be rolled down for privacy if sharing the bathroom with friends. With the larger room, there was more space in the bathroom as well. 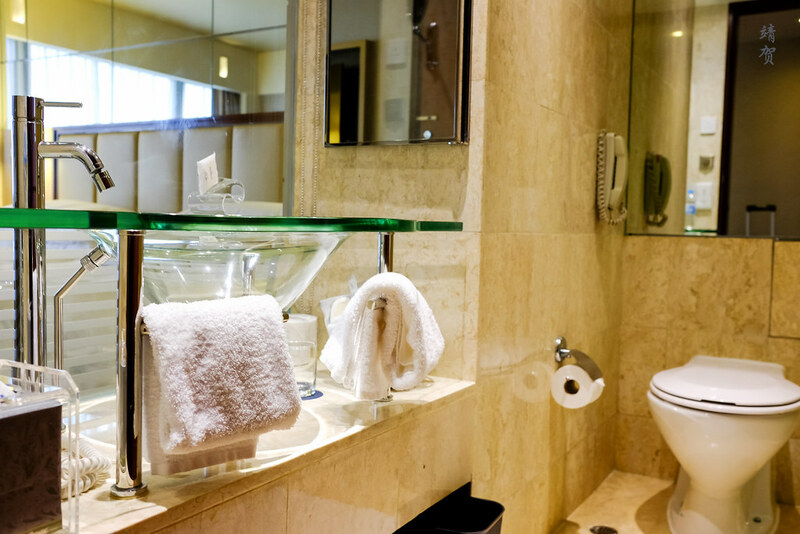 The countertop remains similar in the transparent glass style but there was an alcove for the positioning of the toilet. 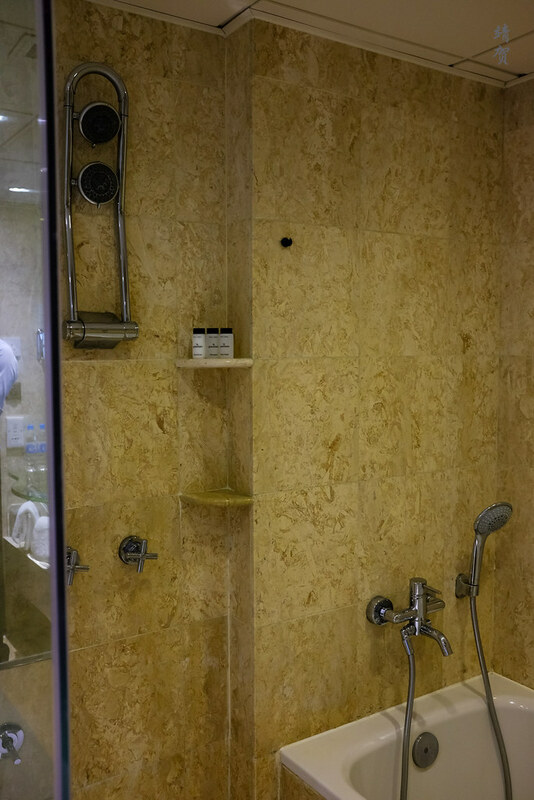 What makes this room much better though was the separate bathtub with a stand-up shower space featuring upgraded shower heads. This makes the bathroom much more pleasant for long showers, though the bathtub still remains on the smaller end of the scale. Another highlight was the harbour view, since this room faces the harbour directly. However the scaffolding around the Museum complex across the street spoils it somewhat. 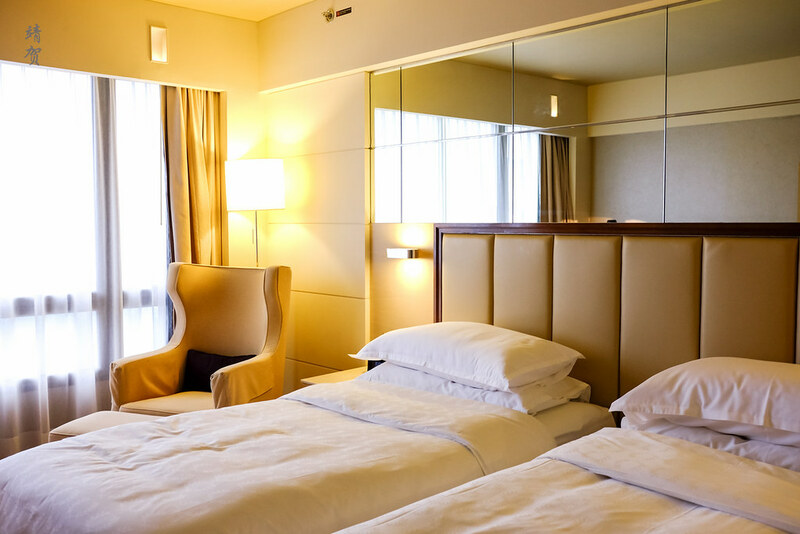 Even if you are not for the harbour views, these deluxe rooms are definitely much better than their standard rooms and I would request for them whenever possible. 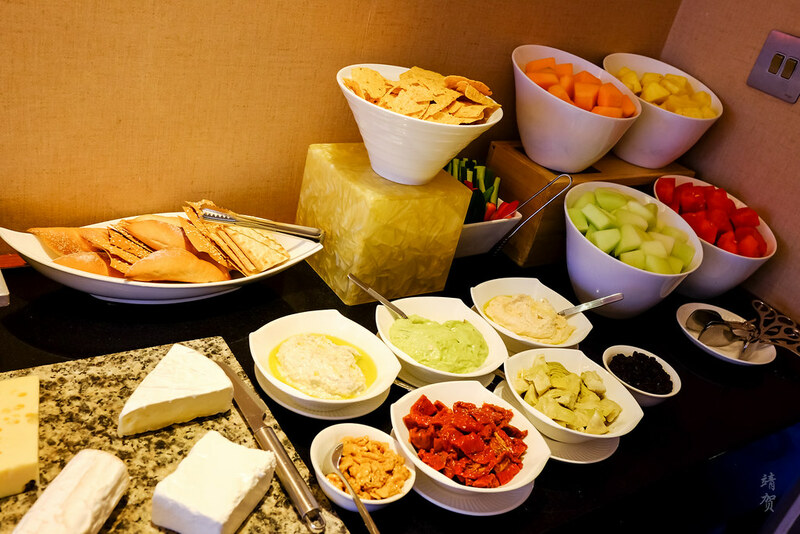 SPG Platinum club lounge is located on the 11th floor where there was happy hour snacks served every evening. 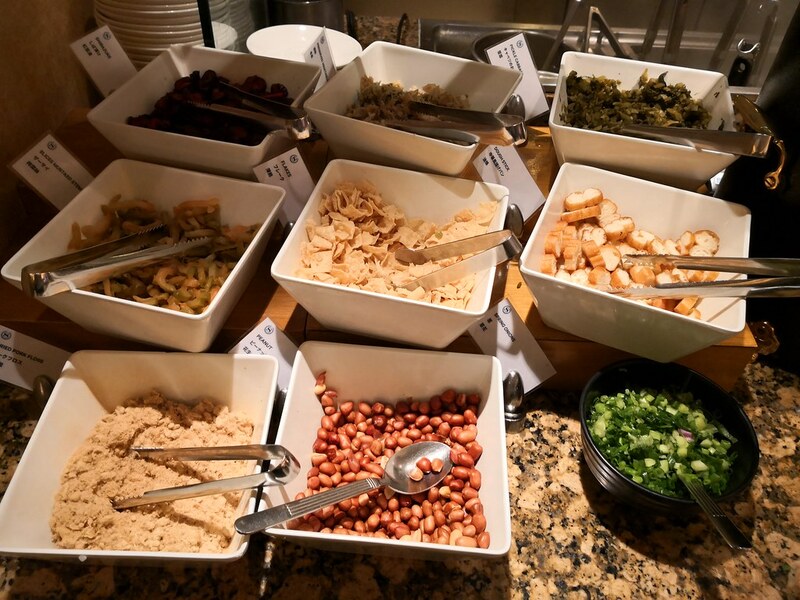 While separate from the Towers Executive lounge which I visited before, this lounge still has a great range of food and beverages. 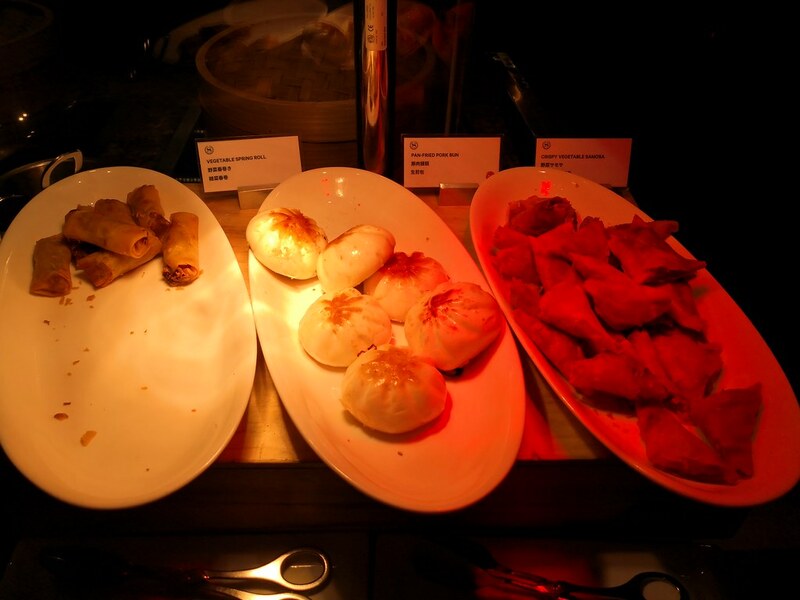 There was steamed BBQ pork buns, BBQ pork pastry and assorted fried snacks like spring rolls and prawn toast. 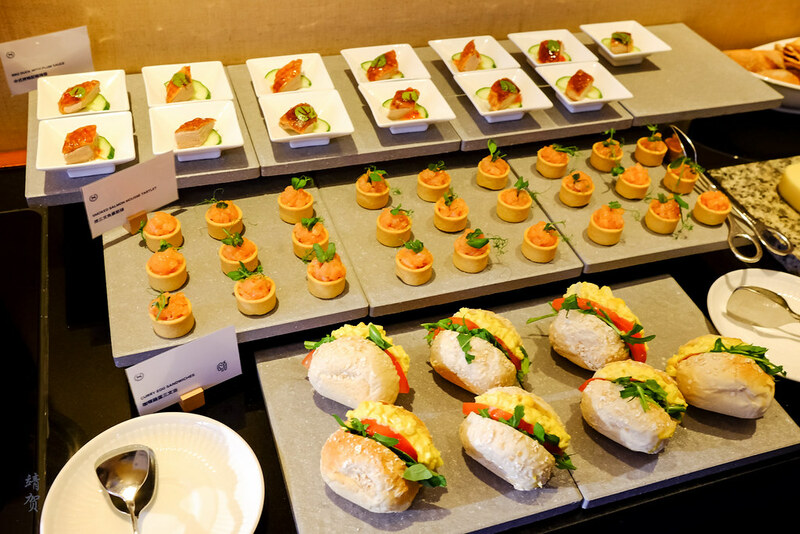 Small portions of canapes was on the buffet alongside mini sandwiches. 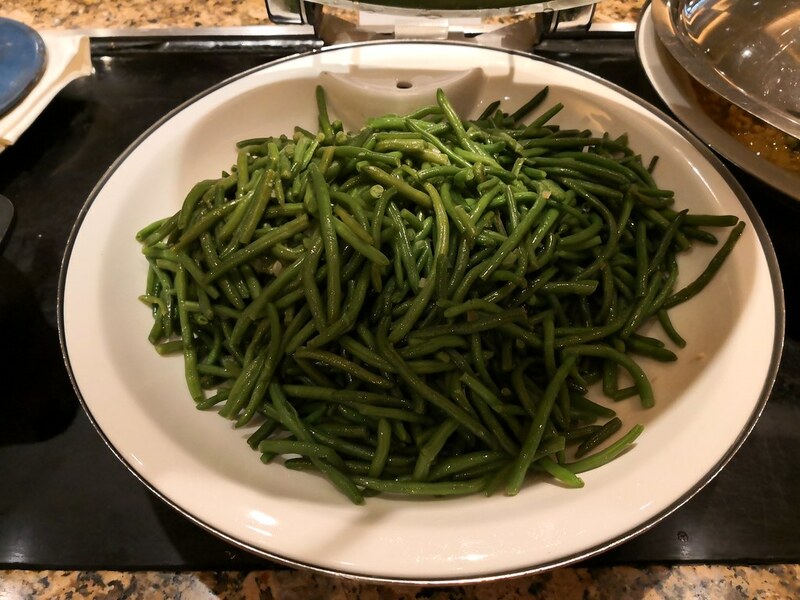 All this made for a nice snack in the evening and could even be a light dinner for guests not wanting to leave the hotel later. 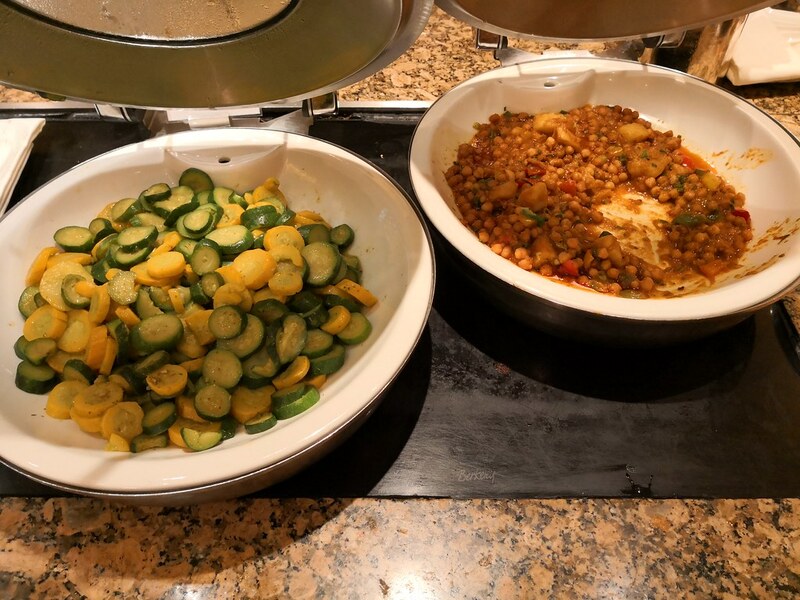 Though with the great food in Hong Kong, I did not eat much in the lounge. 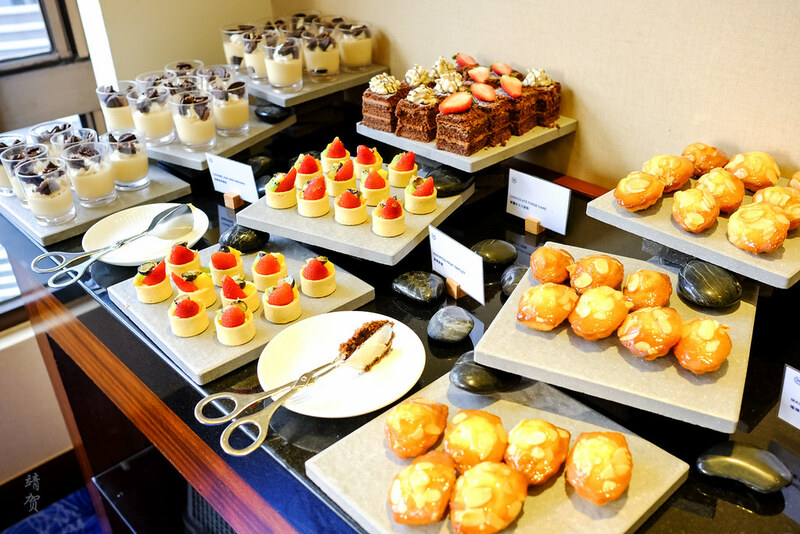 Aside from the main snacks, there was dessert in the form of small cakes and puddings in shot glasses. Sweet pastries were offered as well as cut fruits. 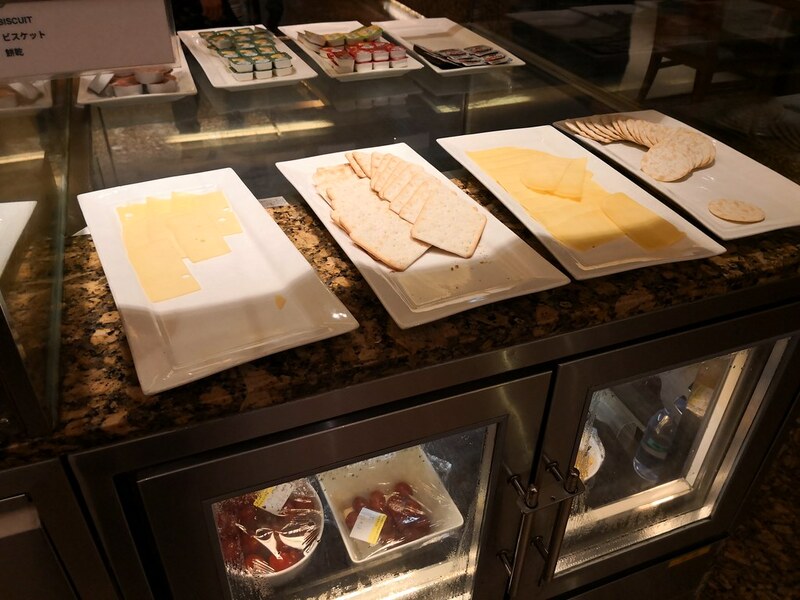 Assorted flatbreads and nacho chips with various dips are standard fare in all club lounges and fitting with the beer offered. 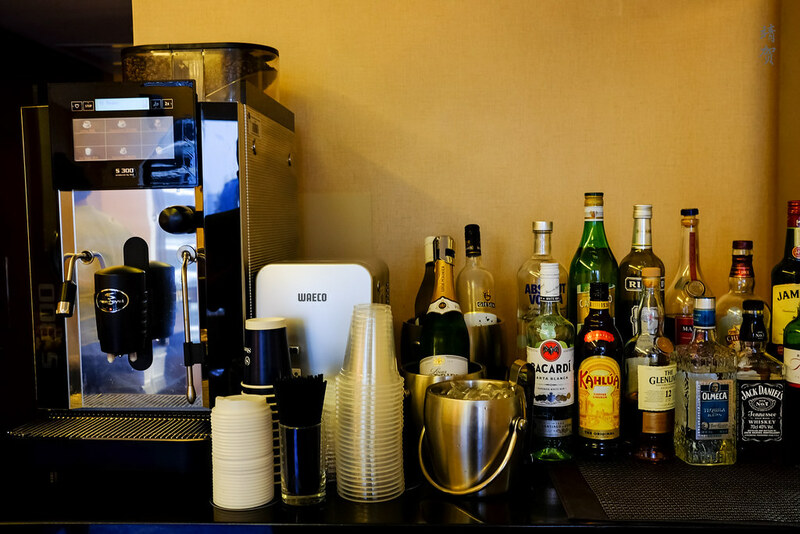 Speaking of beverages, there was an open bar and the lounge attendants were happy to serve you your favourite beverages. 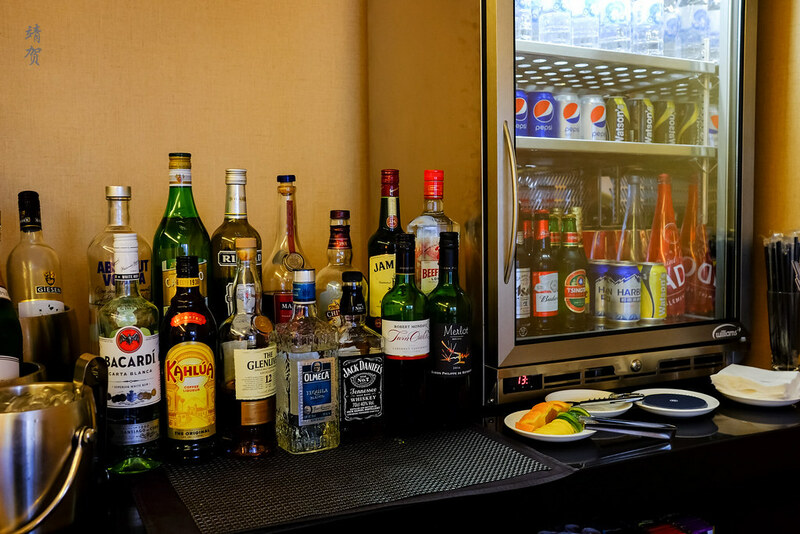 Cold beers are available from the fridge and they have a variety of European and Japanese beer in addition to local Tsingtao and Harbin beer. 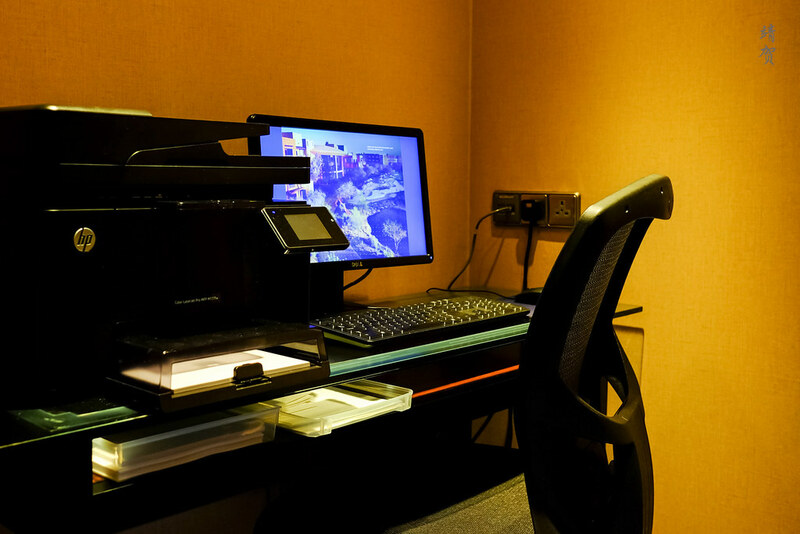 Other than the food, the club lounge has magazines and a workstation facility with a printer so light work can be done by guests inside. However the seating is somewhat limited and the space is not exactly the most functional as the lounge is made up of several rooms joined together to create a lounge. As such guests do not get the best view and the constraint of space does not make it a nice lounge to stay in for long. 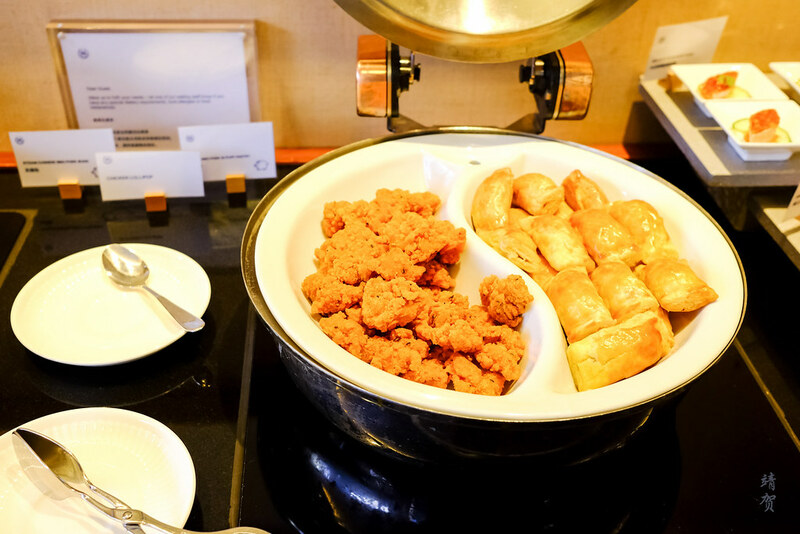 The Cafe on the second floor lobby is the venue for breakfast as there is no breakfast served in the Club Lounge. 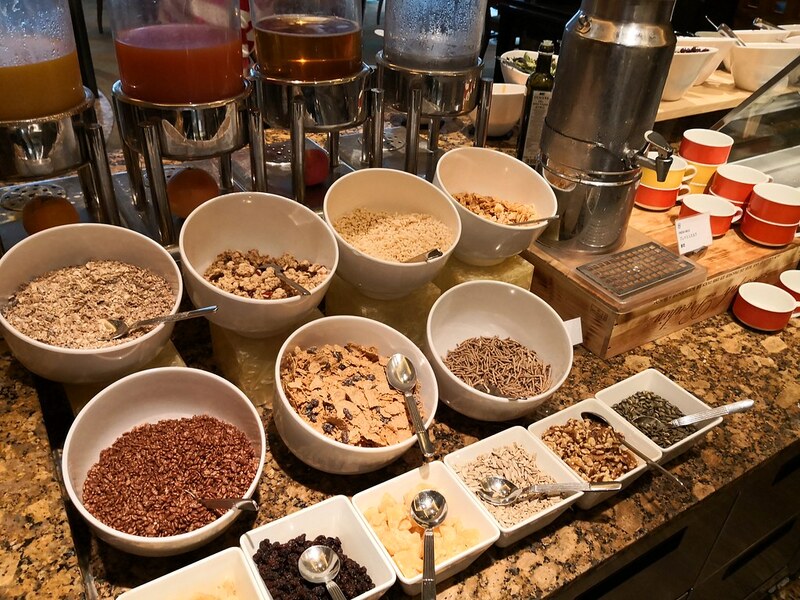 Breakfast is served from 6:30am to 10:30am on weekdays and until 11:00am on weekends. 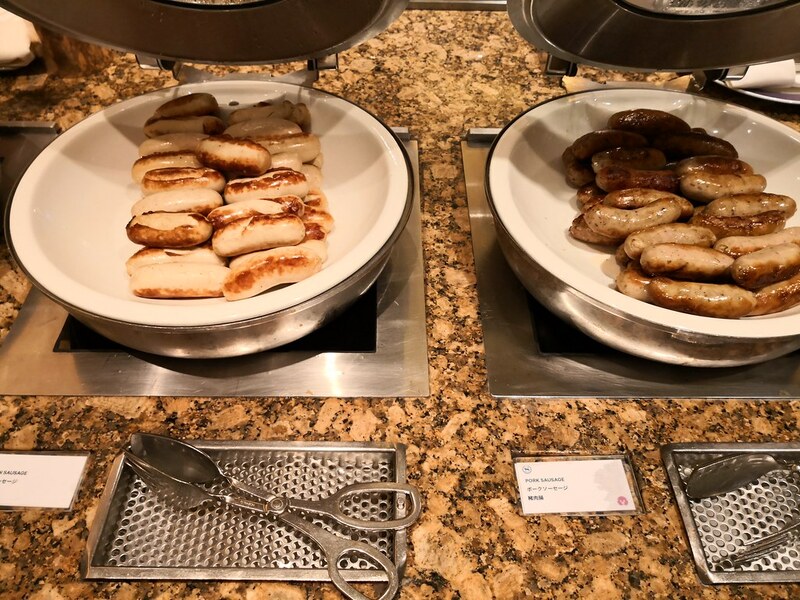 Due to most hotel guests having breakfast in the property, the restaurant can be quite busy and there was a queue on the first day when I had breakfast to enter the restaurant. Coffee is offered upon being seated and specialty coffees were available from the server. 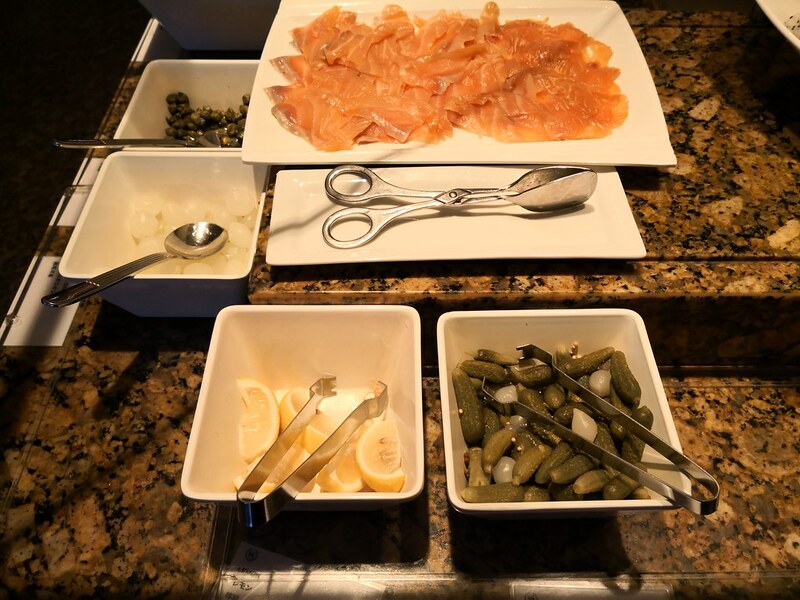 The breakfast fare offered was one of the most comprehensive in a hotel and I would start with the usual selections like cereals, milk, cold cuts and cheese that forms the basic of a continental breakfast. 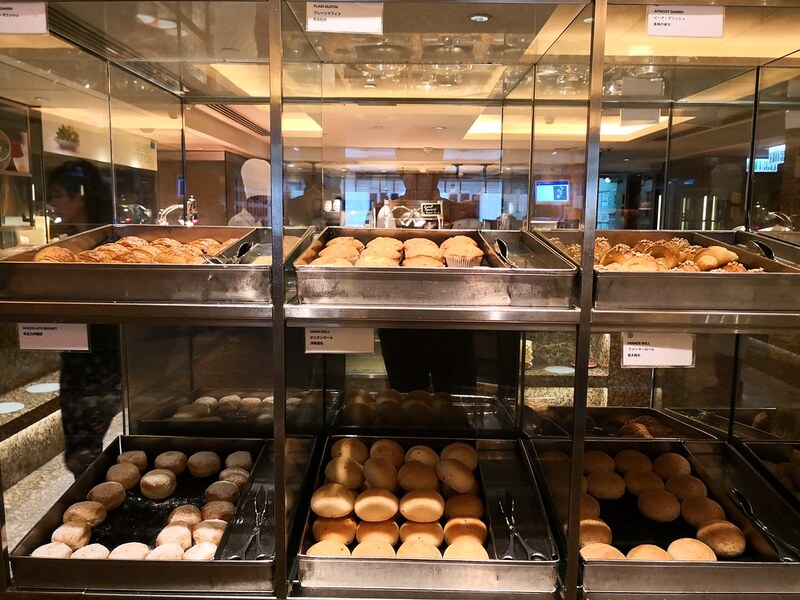 For breads and pastries, there was a lot to choose from since they have a bakery setup within the buffet itself with all the types of rolls and pastries labelled carefully. 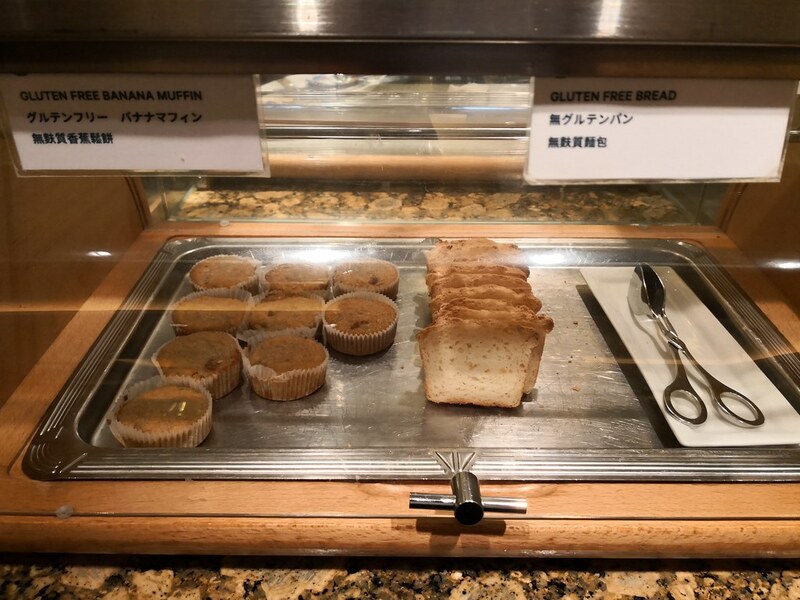 There was a separate section for gluten free options. 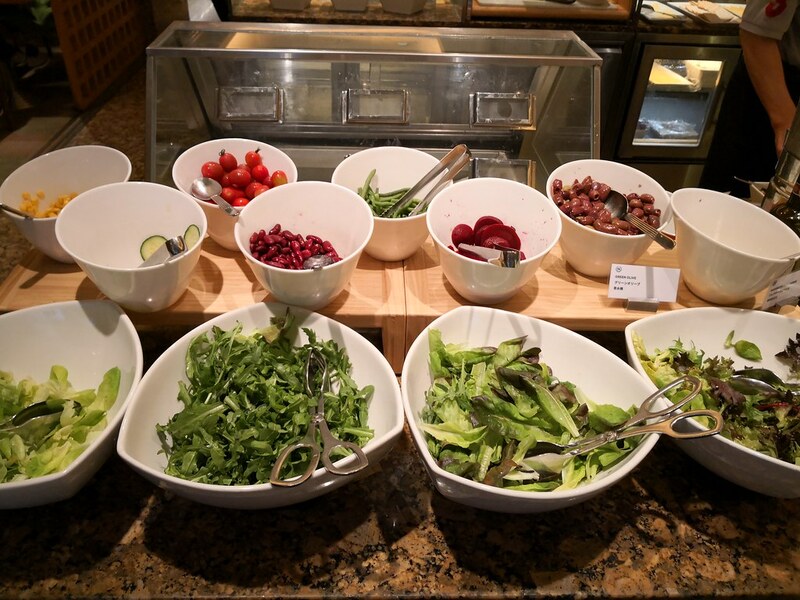 Vegetarians can enjoy breakfast with variety as well since there was stir-fried vegetables and chickpeas available, amongst other things. The vegetables are different on both days I had breakfast here. 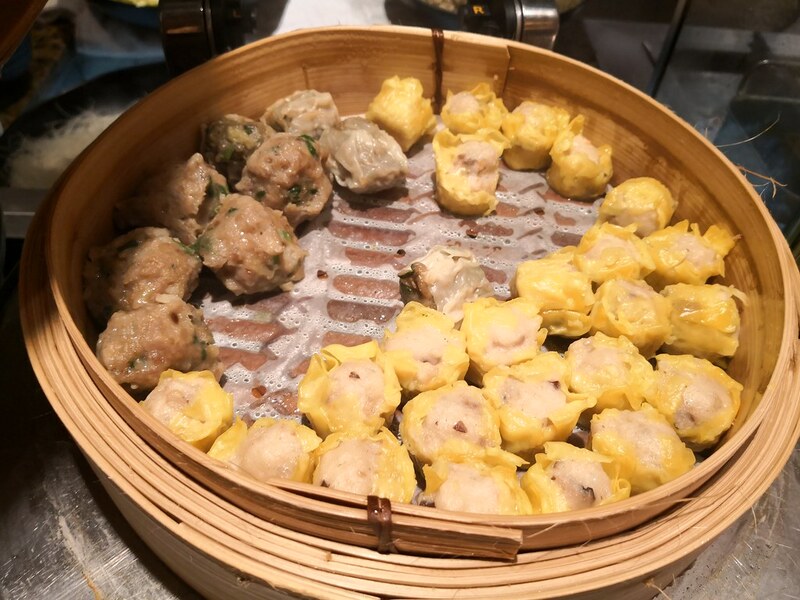 Since we are in China, there was plenty of local dishes. 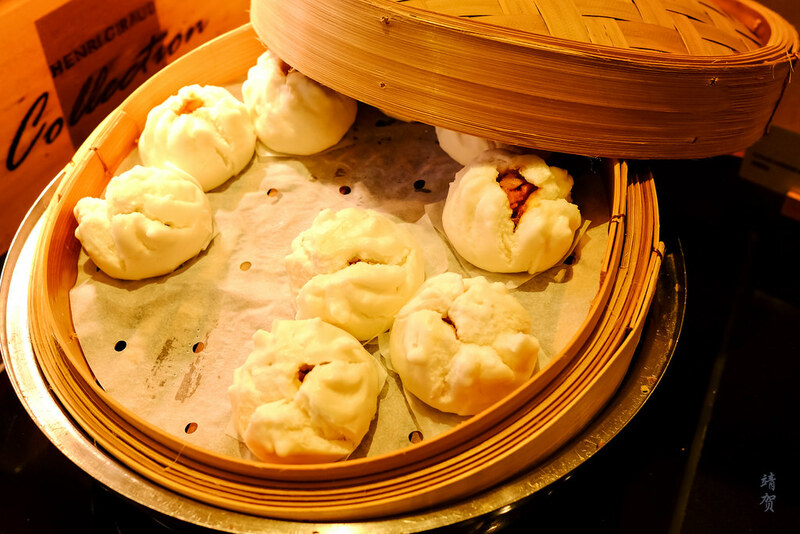 These ranged from pan-fried buns to steamed dumplings. 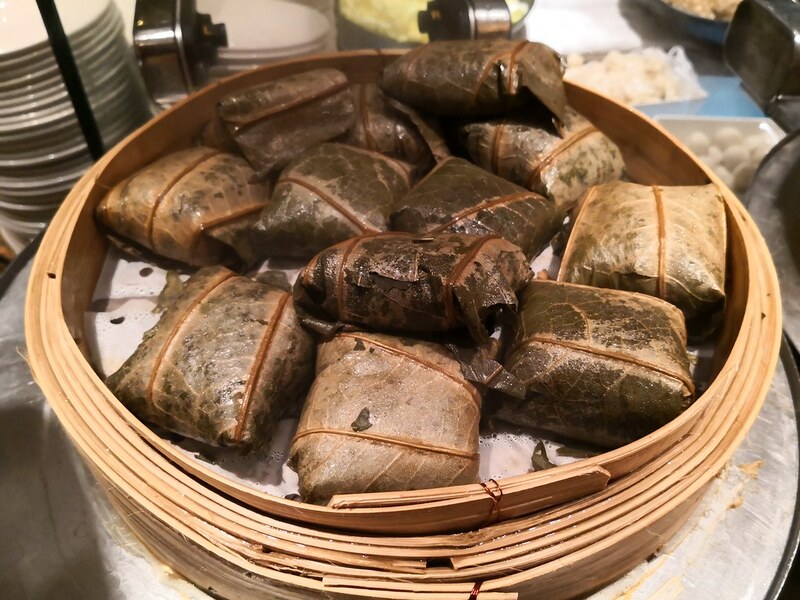 Dim sum choices even includes a glutinous rice dumpling. 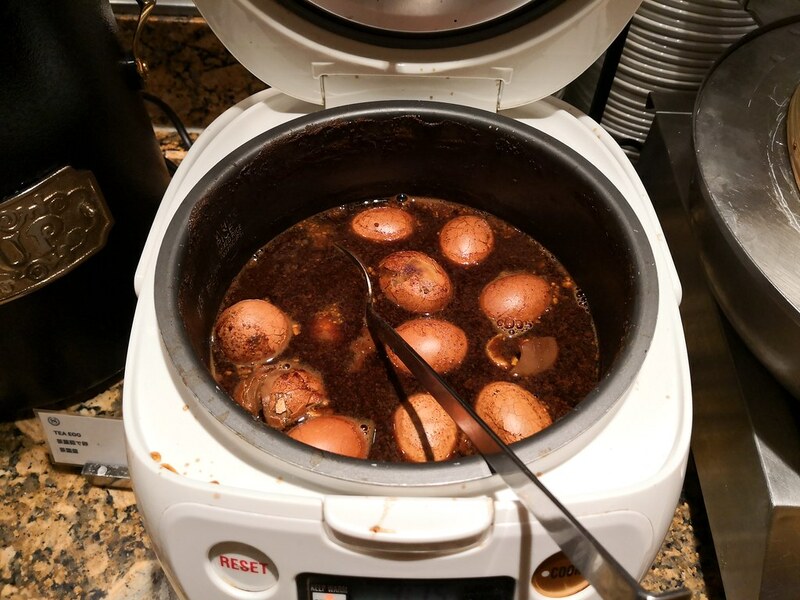 There was even eggs in tea leaves that makes for a tasty snack when in East Asia. 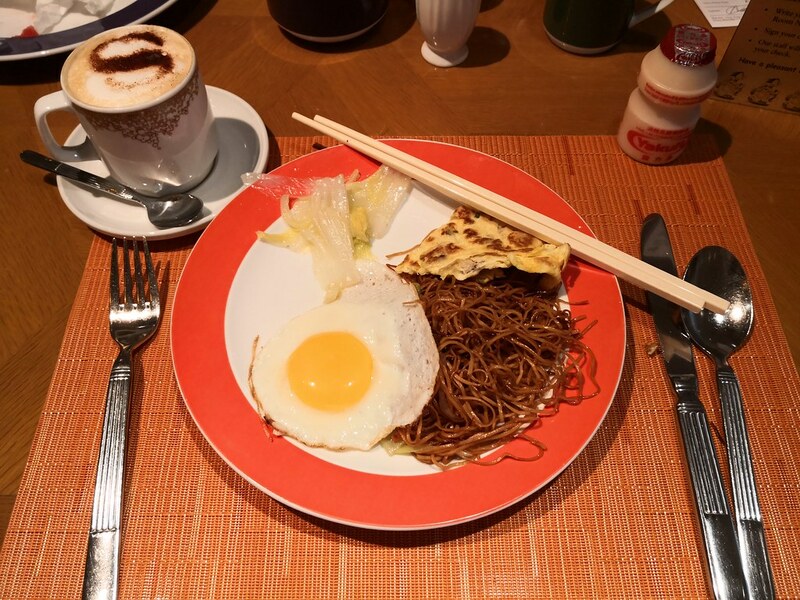 My favourite though has got to be the fried soya noodle that I top up with a sunny side up from the egg station. 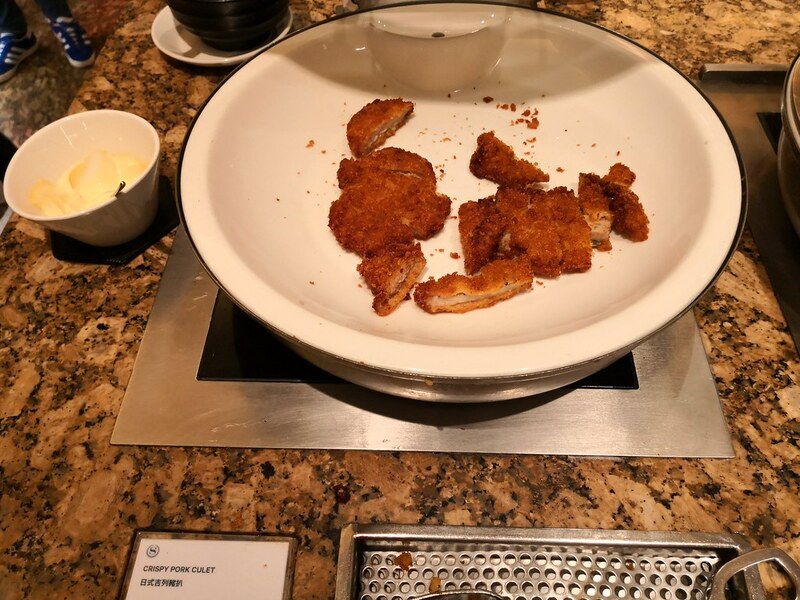 Two types of congee was available as well, one plain and another usually with pork or fish. 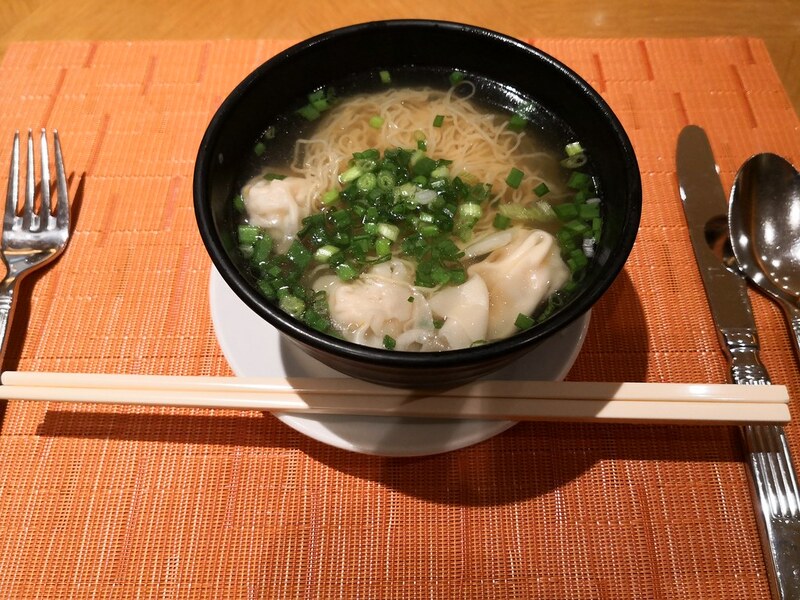 A variety of condiments can be added to the congee or to the made-to-order noodles. 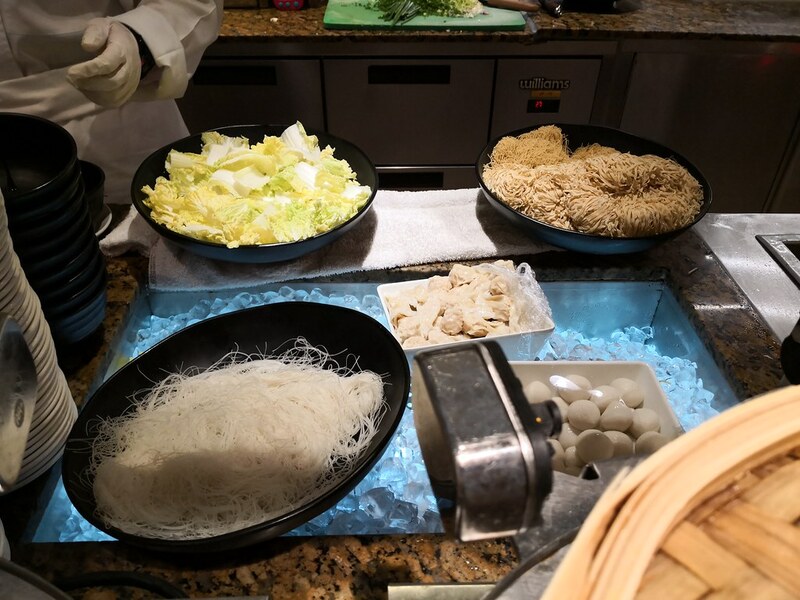 Guests can pick from a variety of noodles and toppings from fish ball to wonton and they are definitely great for variety when staying in the hotel over several days. 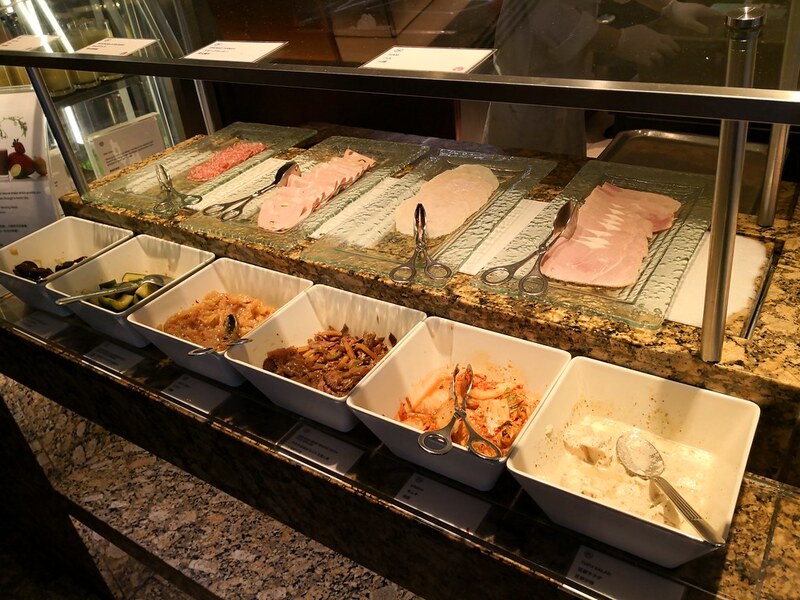 Other standard hot dishes like bacon and sausage was on the buffet and the variety extended here to some Asian dishes like crispy pork cutlet or grilled fish with teriyaki sauce. 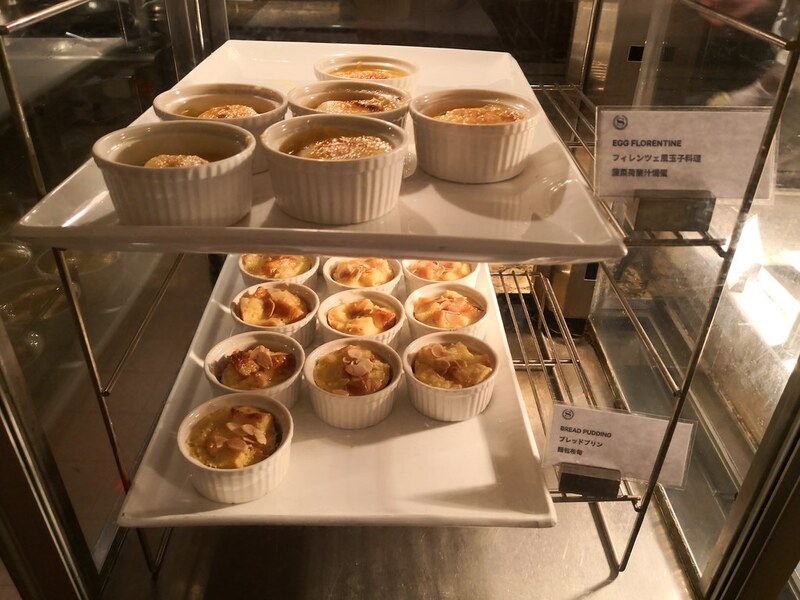 For sweet dishes, there was a selection of French toast, pancake or waffles and small prepared portions of egg florentine and bread pudding from the cabinet. 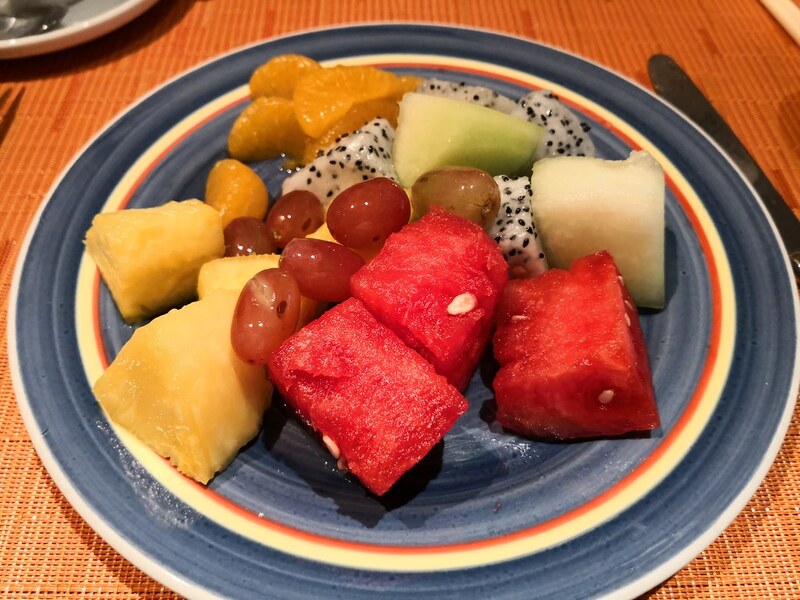 The fruits served in the buffet was fresh and diverse such that I always end up filling my plate even at the end. 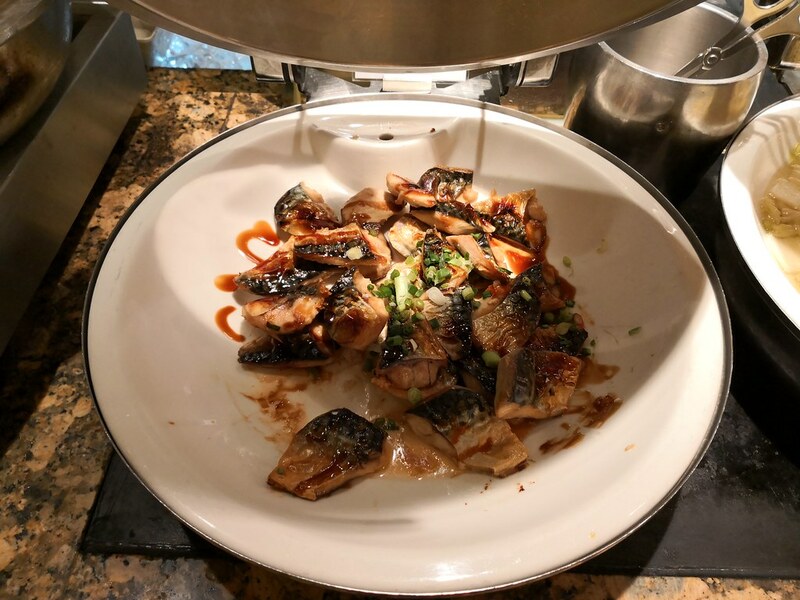 On top of all these dishes, the chef comes around sometimes with daily specials and this shows the great service from the staff in the restaurant such that I do not mind that much how crowded and noisy the place becomes during peak hours. 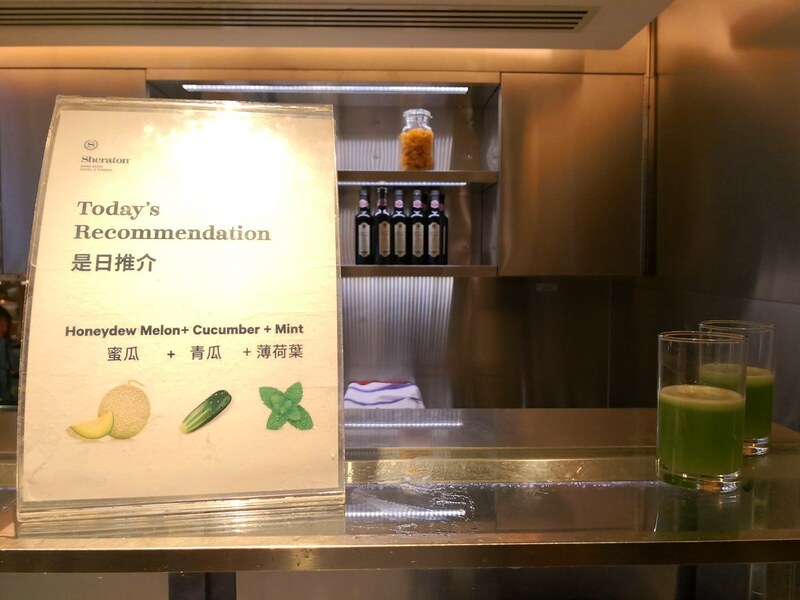 And if you are feeling sinful after the feast, there is healthy smoothie of the day from the juice section to help you wash all the food down! 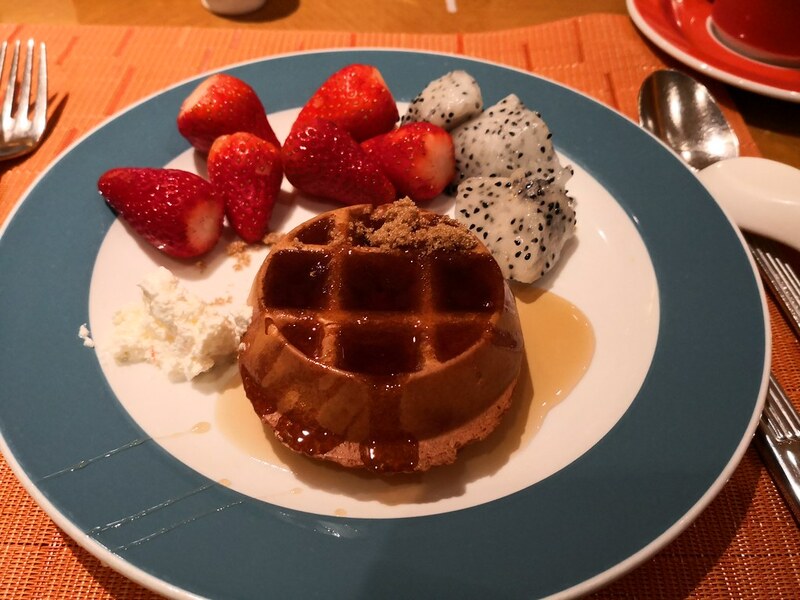 Basically, the breakfast is worth it in this hotel, though when I am in Hong Kong, I cannot help but recommend that first time visitors try out dining at one of the numerous cafeterias spread around town for a local breakfast experience. 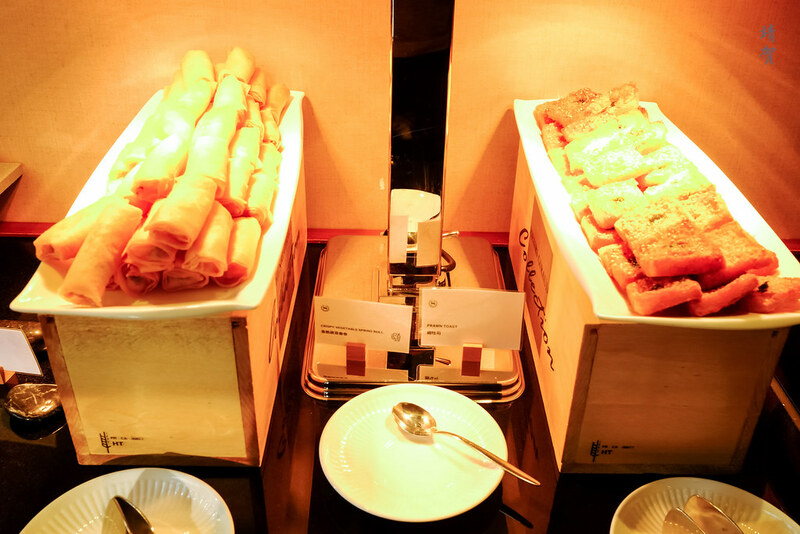 Aside from the Cafe where buffet breakfast, lunch and dinner is served at, there are several restaurants in the property. 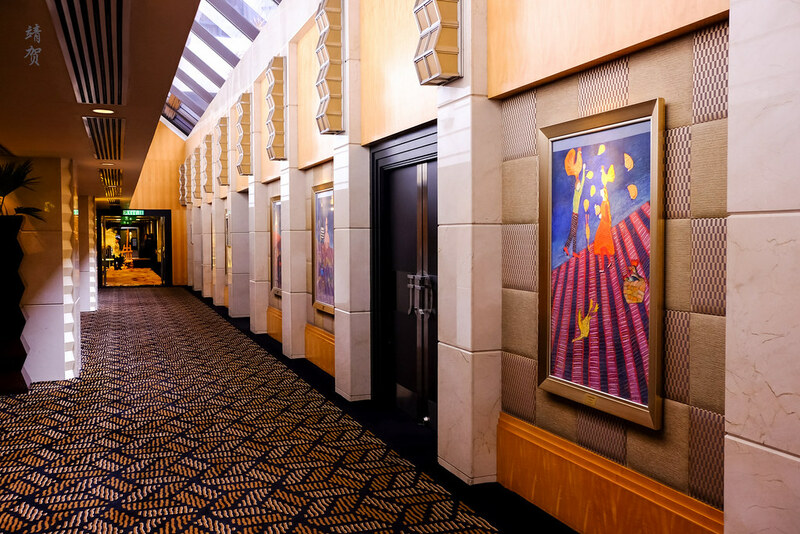 Morton’s Steak House is located on the 4th floor, and Unkai Japanese restaurant can be found on the 3rd floor. Above the lobby floor, there are several meeting rooms. 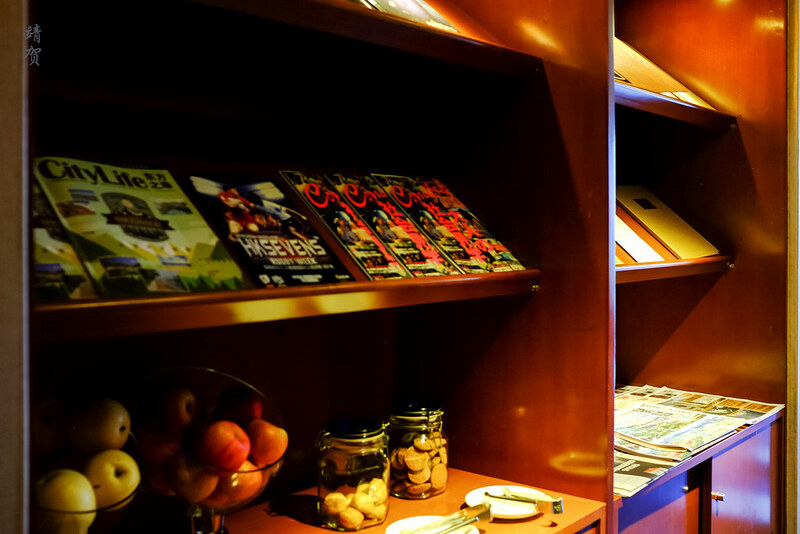 At the top of the hotel, there is a Sky lounge and wine bar access on the 18th floor. This floor is shared with access the fitness centre and the stairs to the outdoor swimming pool deck. During my stay, the small fitness centre was busy, with a fitness session held in the studio and the exercise room filled with guests. 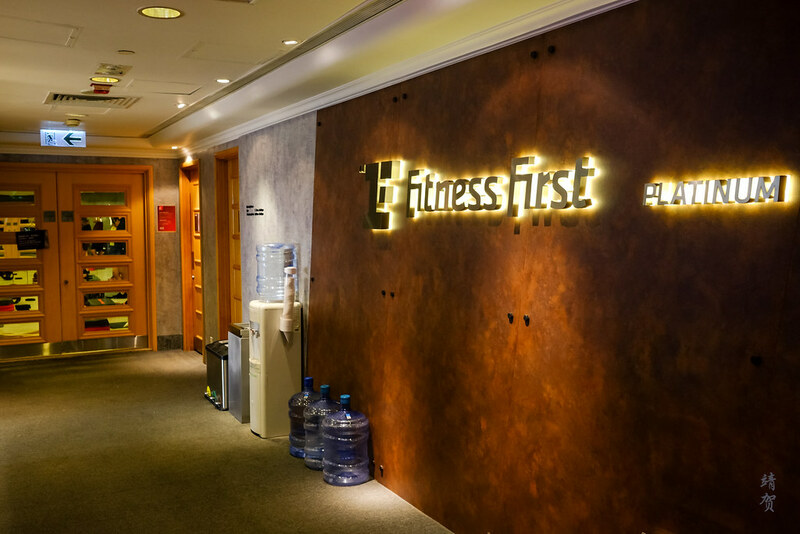 Since the fitness centre is operated by Fitness First, I believe it is used by locals who have a membership here. 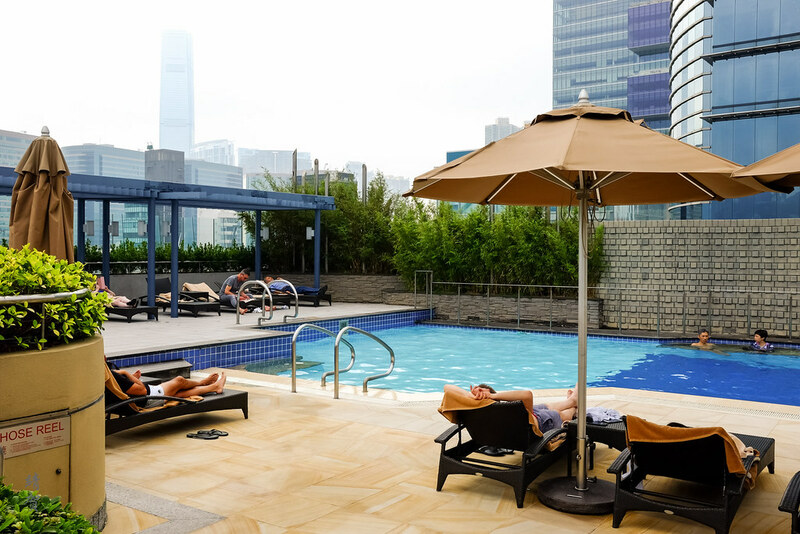 For a city centre hotel in a dense metropolis, the outdoor pool deck is a great place to unwind for hotel guests. 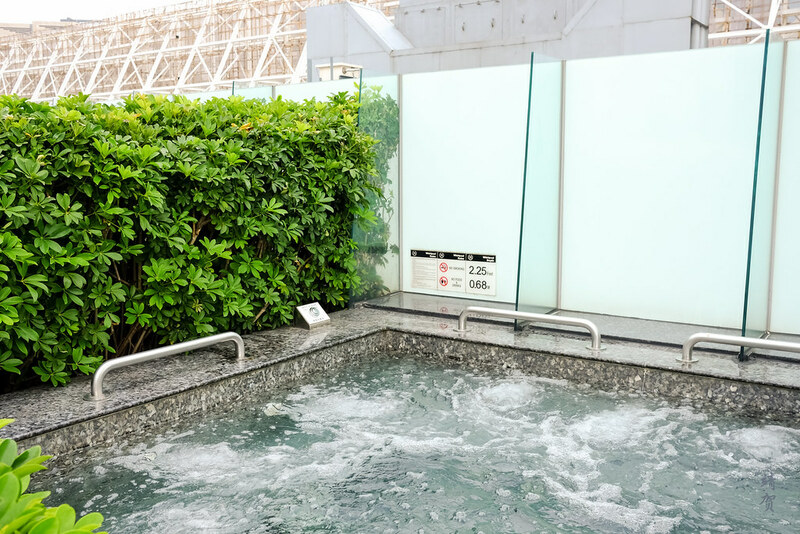 There are deck chairs around the pool to enjoy the open space and several jacuzzi whirlpool that can be used. 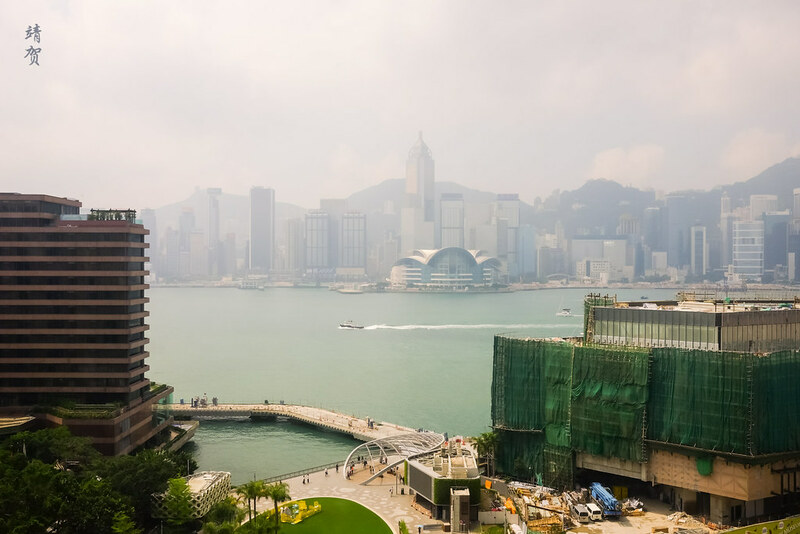 As the tallest point in the property, the view here of the harbour is perhaps the best and that could be the best reason to relax in this venue when staying in the Sheraton. 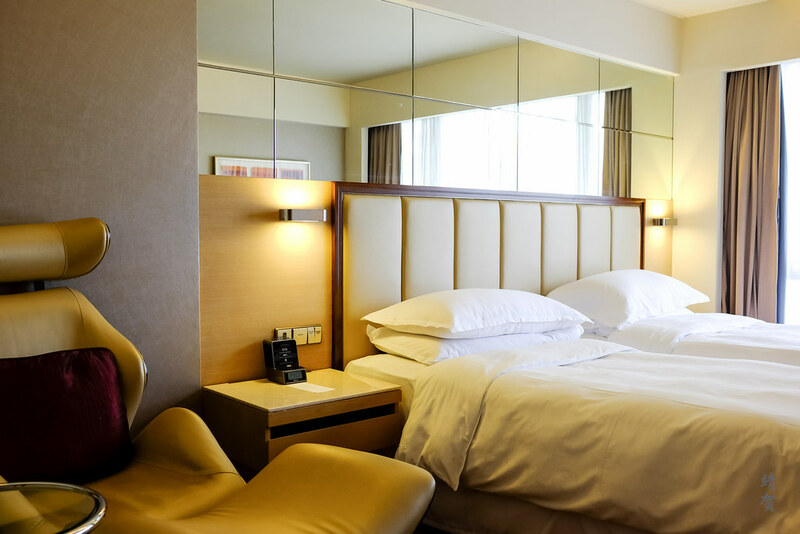 The cost per night during my stay came down to around HK$2,200 after taxes (~$280) and this is perhaps one of the most expensive Sheraton I would stay at. 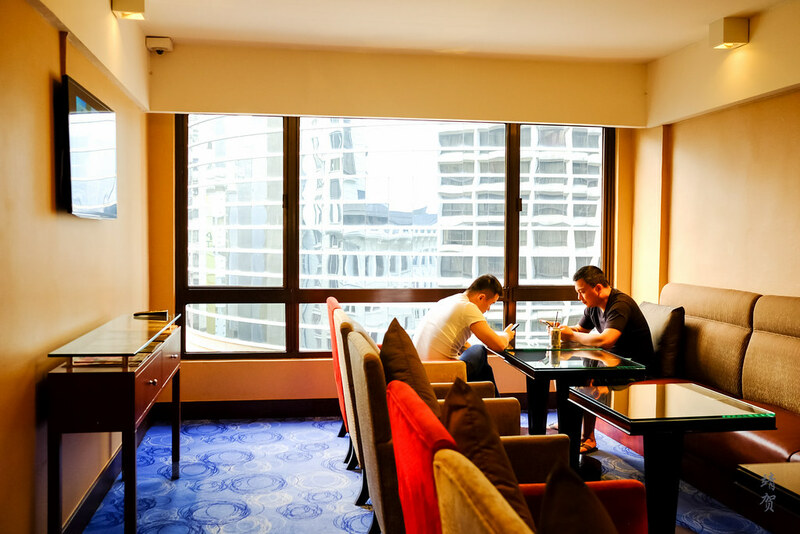 While the standard room leaves little to be desirable, the upgrades and the breakfast included for Platinum guests does make this hotel somewhat reasonable considering how expensive hotel rooms are in Hong Kong.